I love to see birds in the snow don’t you? In my backyard, in the woods, at the park….anywhere is fine with me. The reason being is because you just never know what birds you are going to see. You see when it snows birds have a harder time finding food and water because everything is covered with that beautiful, glistening white, fluffy stuff (can you tell I like snow?). So they count on backyard bird feeders to help with their diet. That is why it is so important to feed the birds in winter. 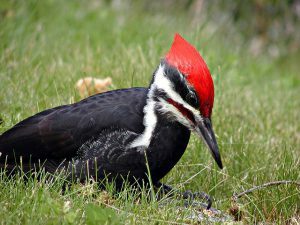 Birds need energy for survival which they can get from a good supreme mix bird seed or from suet that contains high energy ingredients like lard or peanut butter mixed with bird seed and also with fruits such as raisins or cranberries and unsalted peanuts. Feed The Birds In Winter! 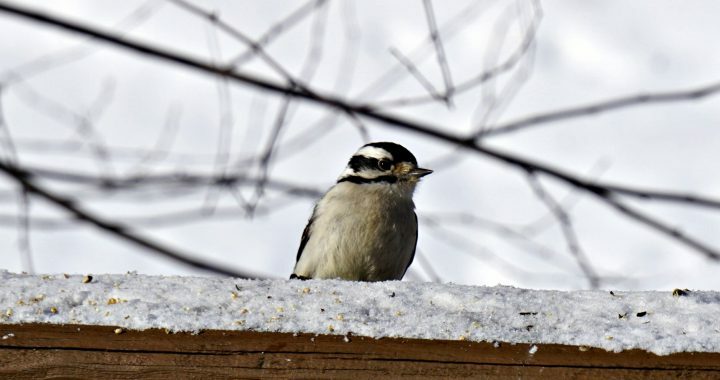 You should provide food for the birds on a daily basis if you have the desire to feed them during the winter time. If it snows or it is icy or just plain freezing outside, you should feed them more often especially when you see that the feeders are empty. Why? Because more birds are definitely coming in to the feeders at this point. Just to give you an example. 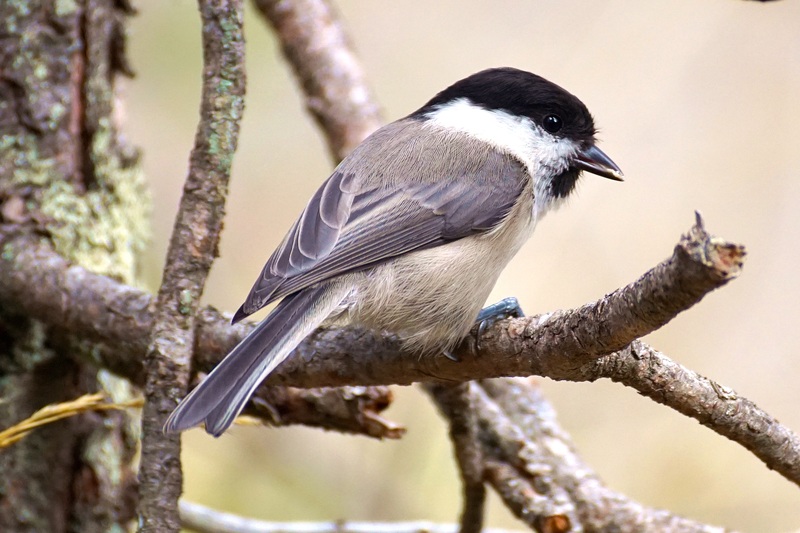 My regular backyard birds right now are Cardinals, Blue jays, Mourning Doves, Carolina Chickadees, Tufted Titmice, Dark-eyed Juncos, White-breasted Nuthatches, Red-bellied and Downy Woodpeckers, White-throated Sparrows, and the ever present House Sparrows. When a really good snow comes or an ice storm (OH MY!) or when it is below freezing, I get an abundance of these birds coming in to my feeders, definitely more than usual. But on top of that there will be additional species of birds coming in that usually get their food elsewhere. 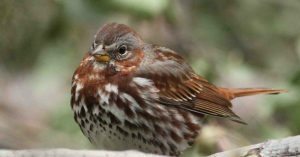 Such as the Fox Sparrow (photo right) who eats berries and also the seeds from Smartweed, a wildflower found along roadsides and railroad tracks. Consequently, Fox Sparrows are not a regular at my feeder. There is also the Purple Finch that may drop in or the Tree Sparrow. Purple Finches, Red Crossbills, Pileated Woodpeckers (photo left), Northern Flickers, Hairy Woodpeckers, and Red-breasted Nuthatches, may also bless me with their presence. You just never know what new species of bird might pop in when it snows. It is a fun time to watch the feeders as you can imagine. 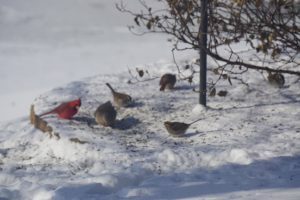 Winter is a fun time to feed the birds and also an essential time as birds cannot always get to food. This is especially when it is freezing outside or when there is snow covering the ground. Making sure your seed and suet feeders are filled is a must if you care about your feathered friends. This will give them the energy that they need for survival. Don’t forget water too. You can get heated birdbaths so don’t worry about water freezing. Right now in November, you may or may not be experiencing cold temperatures. Where I live it has been in the mid to upper fifties for a few weeks now but I am still making sure to put seed and have suet out each morning. But come the First Snow, which I hope is very soon, I will make sure that there will be enough bird seed and suet for all the birds throughout the day keeping an eye out for empty feeders. Every bird is welcome, even the newbies! What is the weather like where you live? Any new birds coming in to your feeders? I would love to hear from you. Please feel free to comment below. Posted in Backyard Birds, Songbirds, Woodpeckers. ← Great Blue Heron…or Crane?